Woohoo! 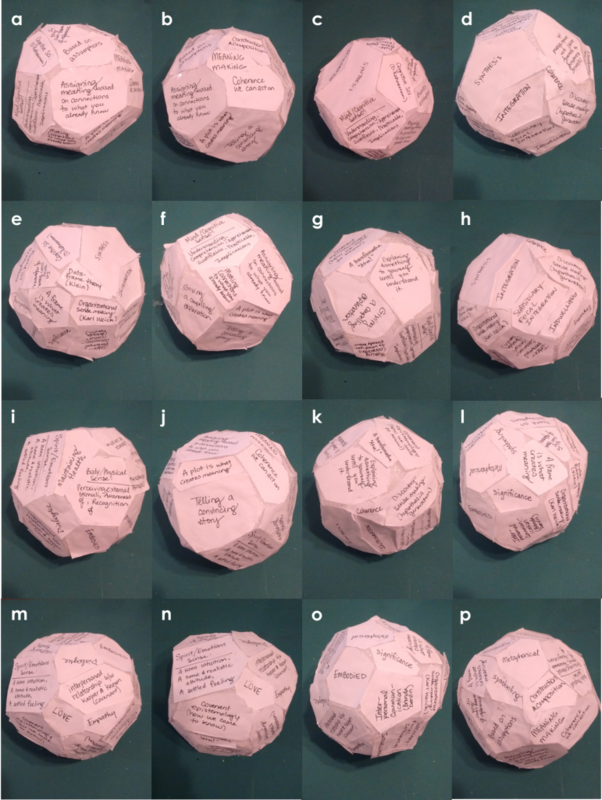 I’ve covered the entire surface of the ball with labels that I brainstormed from the literature, the dictionary, and readers. It’s now what I pictured it would become: a multifaceted concept-object! Let’s all pause and celebrate with a fist pump. Then, I spent an hour turning it over in my hands looking for insights into “sense making,” but I think there is so much information I get through the three dimensions, my eyes, and my hands, that I couldn’t make sense of any of it! A typical case of TMI. So, I put it down and started taking pictures, turning the 3D into 2D–just looking from a particular viewpoint, which is what most (all?) research does with concepts. The biggest pattern I saw is probably a pattern I imposed on the concept–the pattern of a three-part model of humanness: body, spirit, and mind (I got that from Plato, and I like it). To be fair, the dictionary entry for “sense” also seemed to fit this three-part pattern. 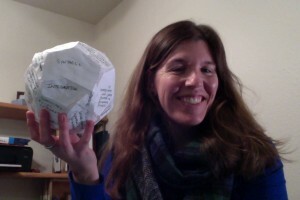 So, there are at least three points of view of the ball, one centered on each of the “body, spirit, and mind” facets. Three aspects of sense making. But here’s what’s interesting: there are other aspects! In other words, the concept of “sense making” is not comprehended by that three-part pattern. Some themes seem to emerge from the confluences between those three major facets, like on the dark side of the moon so-to-speak. Can you help me find them? Look at this panel of images, one of each viewpoint of the ball, and try to give each a caption. Some might not have a coherent caption, but some definitely do. If we can together identify and then confirm these new aspects of sense making, then we’ve got some interesting findings to report! Pattern recognition is the first step in discovery: let’s go! 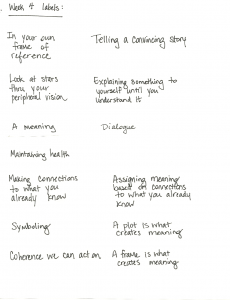 16 aspects of sense making: what are they? Help me by labeling them in your comments below. so far .. this week… i am seeing/understanding… how…turning an intellectual concept into a concrete 3 dimensional object can help understanding..a new thought a new subject a new concept = learning new things…can be helpful in.. increasing knowledge quicker and more thoroughly. again.. a learning theory.. discussed elsewhere? i havent studied this..in an academic course… but was exposed to it in my health ed classes.. ie, learning behavioral theories and how to teach new behaviors. Sooo. the point is…? 1) Can we discuss further how this labeling benefits us in learning new things? the part it plays in learning…2) and relate your initial reason for doing this back to what you personally have learned? Also… Do you mean to label each photo with a caption or the whole graphic? having a hard time with that due to so much info. I have more thoughts but want to read thru all the comments and prior discussions. Right on, Lynne! Yes, tons of information in that big panel. I was thinking of captioning each lettered panel separately. Like (k) might be “transformative coherence.” If the captioning exercise goes well, then it will be a big step forward in my learning process. I have been a bit absent on providing feedback, but while walking through what I have missed and what is contained within the covered surface I am struck by how well this describes the human condition and how all of these elements not only help, but influence our being. The elements of our decision making process goes so much further beyond the data or information that are stored in the grey matter in our brains. Our experiences, social interactions, mood, etc. all contribute to how each of us makes sense of the world around us. All of this contributes to the mental models we form to help our brain process information in a efficient manner. Absolutely. Sense making is uniquely, gutturally human. So, Joe, how do you feel my proposed definition matches up with this reality? I feel somewhat dissatisfied with it.